Crown Princess Märtha: The American Story explores the beloved Norwegian princess’ lasting impact on U.S.-Norwegian relations. Her advocacy on her country’s behalf during World War II influenced President Franklin D. Roosevelt’s famous “Look to Norway” speech. 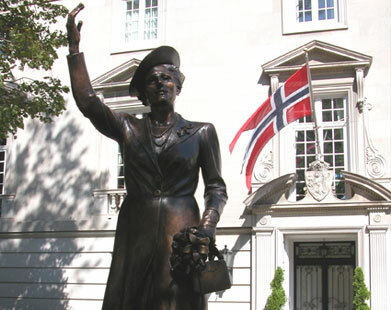 In September 2005, the United States unveiled on the grounds of the Royal Norwegian Embassy in Washington, D.C. a statue of Crown Princess Märtha (who died in 1954) as a symbol of the enduring friendship between the two nations. During the documentary, members of the royal family, including Märtha’s daughter, Princess Astrid, and her husband, the late King Olav, discuss her leadership, grace and commitment.